Sherman Alexie has 1 media appearance. Adaptations is Avondale Library's book-to-film group. For each title, we host a screening party (where we watch a companion film) and an AfterParty (where we discuss the selected title). Patrons are invited to attend either program, and may attend both for the full experience. On The Same Page, the community reading project sponsored by the CH-UH Public Library features the works of Sherman Alexie, in particular The Absolutely True Diary of a Part-Time Indian. Numerous events throughout the community in the fall spotlight Native American culture. It all kicks off at the Cedar-Lee Theater on Wednesday, September 17th with the movie Smoke Signals. Oakland - The Diesel Readers discuss "The Lone Ranger and Tonto Fistfight in Heaven"
Diesel, A Bookstore in Oakland welcomes The Diesel Readers back to the store to discuss The Lone Ranger and Tonto fistfight in heaven by Sherman Alexie on Monday, May 19th at 7pm.In this darkly comic short story collection, Sherman Alexie, a Spokane/Coeur d'Alene Indian, weaves memory, fantasy, and stark realism to paint a grimly ironic portrait of life in and around the Spokane Indian Reservation. These twenty-two interlinked tales are narrated by characters raised on humiliation and government-issue cheese, and yet are filled with passion and affection, myth and dream. There is Victor, who as a nine-year-old crawled between his unconscious parents hoping that the alcohol seeping through their skins might help him sleep, Thomas Builds-the-Fire, who tells his stories long after people stop listening, and Jimmy Many Horses, dying of cancer, who writes letters on stationary that reads "From the Death Bed of Jimmy Many Horses III," even though he actually writes them on his kitchen table. Against a backdrop of alcohol, car accidents, laughter, and basketball, Alexie depicts the distances between Indians and whites, reservation Indians and urban Indians, men and women, modern Indians and the traditions of the past. Sherman Alexie, staunch supporter of independent bookstores and all things literary, is returning to Spokane. He is best known for his award-winning fiction and poetry, including the collection Blashemy: New and Selected Stories, now in paperback. This year’s gathering will be held at the Bing Crosby Theater at 7:00 pm. Doors open at 6:45 pm. No ticket is required, but we ask for a suggested $5 donation at the door to help pay for the venue. This is an Auntie's/Get Lit! co-production. join host Jay Jacobi in discussing Ten Little Indians, by Sherman Alexie. Sherman Alexie's book Heart Berries was available from LibraryThing Early Reviewers. 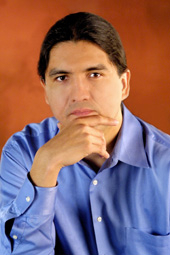 Sherman Alexie is currently considered a "single author." If one or more works are by a distinct, homonymous authors, go ahead and split the author. Sherman Alexie is composed of 5 names. You can examine and separate out names.